If you carry a 32 ACP handgun as your primary or backup personal defense weapon, then you need a reliable self defense round to carry in it. This Winchester 32 Automatic ammo is loaded with the Winchester Silver Tip jacketed hollow point bullet. The 60 grain bullet on this round is designed to expand after hitting its target, having moderate penetration in soft tissue and ballistic gel. Silver Tip jacketed hollow points have been around for many years and have a track record of reliable effectiveness in self defense situations. Each round in this box of 50 is brass cased, Boxer primed, non-corrosive, and reloadable. Many consider the 32 Auto to be too small for effective defensive carry, but with practice and good defensive ammo, this caliber is enough. 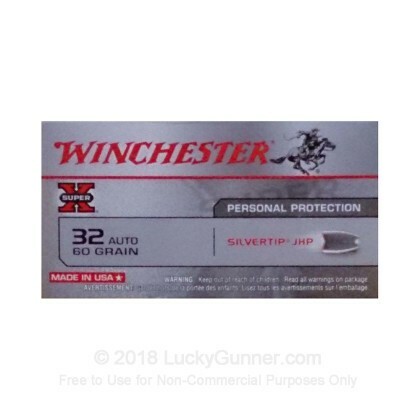 Order your Winchester Silver Tip JHP ammo today. Remember, practice makes prepared. Very high quality self-defense ammo for small concealed carry. My pocket gun maker only recommends this ammo. These feed well and seem accurate in a Kel-Tec P32, but forget expansion. Every test I tried in these and Hornady XTP failed in the area of expansion. Do youself a favor when you use the .32 ACP caliber and buy the Corbon DPX or Pow R Ball ammo. They penetrate and expand very well.